Brian and I are big fans of Bonne Maman preserves. There are usually no fewer than three open in our fridge at all times. Luckily, this means we always have a steady supply of the adorable little jars around the house. 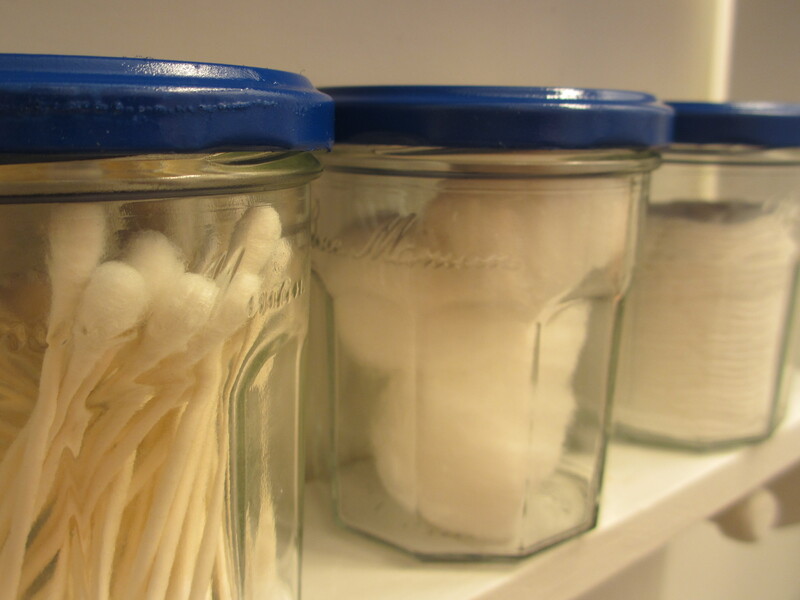 I recently discovered they’re just the right size to neatly store cotton balls, q-tips and more on one of our bathroom shelves. The classic red and white lid, reminiscent of a tablecloth, wasn’t the right look for us, but a quick coat of Rust-Oleum Painter’s Touch (in Deep Blue) quickly changed that. In less than 5 minutes (plus a bit of drying time) I had custom organization solution. This entry was posted in At Home and tagged @SWWUblog, at home, bathroom organization, bonne maman, cheap trick, home decor, home projects, jar projects, jars, organization, painter's touch, Rust-Oleum, spray paint by Something We Whipped Up. Bookmark the permalink.